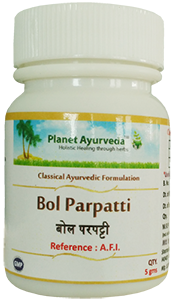 Bol Parpati is an Ayurveda medicine containing both herbal and mineral ingredients in powder form (bhasma). It is mainly indicated for bleeding disorders. It helps to maintain a healthy menstruation cycle. The word parpati is derived from parpata – means papad. Parpati is mainly pota bandha of parada. By this parada will attain its maximum efficiency. Also parada will loss all its impurities (parada dosha). By using the technique of parpati preparation, medicine will get digestive, carminative and bowel binding properties. Parpatis are mainly used in pediatric cases. It is believed to cure all the children’s diseases. Bol parpati is included in sagandha parpati, as this contains gandhaka as an ingredient. Mercury (Hydrargyum, Hg) is a metallic element, liquid in room temperature and was known to the Indians for several millenniums and is considered to be a MAGIC substance. Parada which is available from nature and from the ores is having impurities. By consuming doshita Parada, we get many diseases so samanya shodana is needed. Dosha harita parada cures diseases and helps in anti aging, and then it will act as Amrita (Elixir). Parada is purified by grinding vigorously it with lime in a mortar for 7 days then Parada is filtered through a four folded cloth. It is then macerated well with turmeric (Latin – curcuma longa), gruha dhooma (mainly consists of carbon from kitchen chimney) and ishtika choorna for 3 days. It is washed in sour solution (amla dravya like kanji). This will then undergo special purification process to attain rejuvenating property (rasayanam). This parada is pure with both disease curing and rejuvenating property. It balances vata, pitta and kapha. This is an excellent health promoter and can destroy all diseases. They nourish the whole body and has tonic, aphrodisiac, rejuvenating, anti aging, wound healer and anti microbial effect. Parada has yogavahi guna. This yogavahi guna of Parada plays a vital role in the efficiency of bol badh ras, as this property helps the medicine to reach each and every tissue of the body very fast and thereby enhancing the therapeutic efficiency of the medicine. Sulphur, S obtained from different ores like copper pyrite, iron pyrite; galena etc is also purified first to remove any impurities if present. Gandhaka is melted in an iron pan with cow’s ghee. It is then filtered into milk. This process is repeated for 3 times and then washed in hot water and dried. Gandhaka thus prepared is rejuvenating. It can promote the digestive fire and also cures itching, skin diseases, infections and can remove toxins from the body. Here gandhaka acts as a catalyst. This purified Parada and Gandhaka are grounded well in a mortar (khalwa yantra) until the shining of mercury is lost to prepare Rasa Kajjali. Kajjali is a pure black smooth powder without any luster particles. It can float on water. Latin Name Commiphora myrrha is a tree of burseraceae family. On incision gum exudes from the drunk. This resinous material is known as bola. Bola is light with bitter, pungent and astringent taste and with hot potency. This drug is highly recommended in leucorrhea, arthritic conditions, and painful joints and in management of vatika rogas. It is used for gargling in cases of dental disorders and stomatities. It mainly balances kapha and pitta. Kajjali is heated well and when it changes into liquid form, bola choorna is added. This is pressed with help of two plates to get papad shaped parpati. This is powdered and the resultant yield is bol parpati and is black in color. 250 mg to 1 gm twice daily before and after food or as directed by physician. 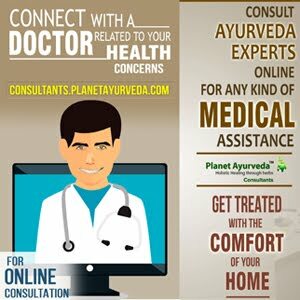 It should be taken along with a proper adjuvant like jaggery, honey, rose water, ashokarishta, durva swarsa (couch grass, latin – cynodon dactylon). Durva swarasa is famous for its wonderful property to arrest the bleeding. Bol parpati is mainly indicated for bleeding disorders. It is observed that while taking bol parpati, the blood vessels get constricted to boost the coagulation process. There by reducing the bleeding. Cold potency of bol parpati accounts for this. In bloody diarrhea, bol parpati is used in combination with other medicines. Bola parpati along with akik pishti or kama dugdarasa or chandraka rasa is indicated in bloody diarrhea. Intake of sweet and astringent food is encouraged during bol parpati use. Cold potency foods are also good. Milk, ghee etc. is mainly advised. Eat more fiber and stay hydrated. Coconut water can be used. This helps to balance the electrolytes lost from the body during bleeding. Legumes should be included in the diet. Durva (cynodon dactylon) juice can be taken in the early morning. Avoid the intake of heavy and pungent food. It is always better to avoid the food items that increase body heat like cold drinks and oily foods. Also try to avoid strong alcoholic beverages and high caffeine consumption. Limit the use of gassy foods like urud dal (black gram), masoor dal (red gram), horse gram, mustard etc. Restrict the intake of white flour. Medicine should be taken under strict observation of your physician. Self medication may lead to have dangerous side effects. Dosage should be corrected according to your age, strength, body constitution etc. An overdose with medicine can be fatal. Pregnant ladies and breast feeding mothers are strictly restricted from the use of bol parpati.